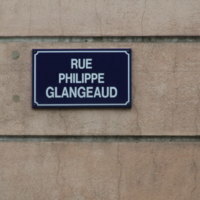 Philippe Glangeaud was born on October 8th 1866, in Saint-Dizier-Leyrenne, a little town in the French département of Creuse. Because he academically belonged to Clermont University, it was in the very same town that he began studying natural science and eventually obtained a bachelor’s degree. His skills got him noticed by Professor Julien, who took him as his assistant in the Faculty of Sciences (1887). At the same time, through an examination, he became a substitute teacher in the town’s School of Medicine and Pharmacy (1888). In 1890, Philippe Glangeaud obtained a scholarship for the agrégation at the Museum of Natural History, Paris - which he brilliantly obtained. Then, under the direction of Munier-Chalmas, he successfully defended his thesis in 1895, with the highest honours. The topic of his thesis was Le Jurassique à l’Ouest du plateau central : contribution à l’histoire des mers jurassiques dans le bassin de l’Aquitaine [Jurassic deposits west of the central plateau : a contribution of the history of Jurassic seas in the Aquitanian basin]. His stay in Paris allowed him to meet some of the greatest minds in French geology of his time : Gaudry, Fouqué, Lacroix, Michel Bertrand. Philippe Glangeaud particularly asserted Fouqué’s heritage. Fouqué was a professor in the Collège de France and introduced petrography in France. He first introduced the idea of nature and order of succession of the eruptions of the ancient Cantal massif. Philippe Glangeaud managed to remember the lessons of his cherished master, for the physical-chemical study of lava of the different volcanic areas of Massif Central, which, even though seemingly similar, are in reality quite diverse. His studies, essentially speculative in nature, were interrupted by work sessions on the field, not only in France, but also abroad, as his notebooks testify ; the School of Advanced Studies sent him to Germany, Switzerland, England and Italy, where he focused on the analysis of the central volcanic regions. His collections of articles - more than thirty published by the age of 32 - brought him the attention of the research community (2 prizes before 1900, the Saintour prize of the Collège de France and the Viquesnel prize of the Geological Society of France), as well as that of the academic authorities. Thus, Glangeaud was appointed of lecturer in Geology and Mineralogy newly established in Clermont-Ferrrand in 1898. The cursus honorum of the geologist was not meant to slow down ; while still in Clermont-Ferrand, he became an assistant professor in 1901 ; he succeeded Julien as holder of the chair of Geology and Mineralogy at the latter’s death in 1906. His scientific production whose activity from that point on came within the scope of the Massif Central kept being prolific ; in the compendium of his works, published after the report awarded by R. Fric the year of his death, we can account more than a hundred papers on the region, for the most part published in the Comptes rendus de l’Académie des Sciences and in the Comptes rendus de la Société géologique de France. His curiosity spread from the Monts du Forez to Limagne, from Mont-Dore massif to the Chaîne des Puys, from Limousin to Livradois. It was Philippe Glangeaud who demonstrated the existence of a collapse inside the region of Mont-Dore and La Bourboule. It can be said that he laid down the modern scientific fundaments of the study of the Massif Central geology. Furthermore, he strived to generalize geology through contributions to guides, reviews, or through the elaboration of monographs of a great quality of clarity of exposition. The dean of the Faculty of Sciences of Clermont-Ferrand said at the funeral of Philippe Glangeaud that his works were suitable for an immediate practical application, as much in matters of thermalism, supply of drinking water as in matters of energy (electricity or search for oil in Limagne). The numerous calls from the Ministry of Public Works for his expertise were rewarded with the attribution of the grade of Officier de la Légion d’honneur. The last ten years of the professor’s life were marked by illness, to which he succumbed at the end of summer of 1930. The funeral was an occasion to pay him homage and was followed by the elevation of a bust at his effigy in the Jardin Lecoq (Clermont-Ferrand), as well as the granting of his name to a street of Clermont-Ferrand, near the universities. 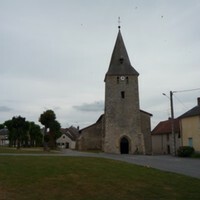 The village of Saint-Dizier-Leyrenne, where Philippe Glangeaud was born. 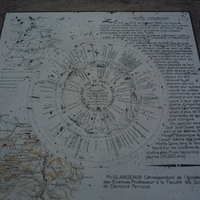 The geological notice of the Massif du Sancy, written by Philippe Glangeaud, located at the top of the mountain. 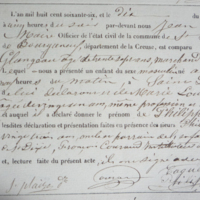 Philippe Glangeaud's birth certificate, from the city Hall of Saint-Dizier Leyrenne (Creuse).